In 1991, I and millions of others saw our homeland dissolve into chaotic violence," writes Bogdan Denitch in his forthcoming autobiography. "There was an endgame, apocalyptic atmosphere in the circles of democratic dissident intellectuals among whom I moved in Belgrade, Zagreb, and Ljubljana." The journey recounted in Changing Identities: A Story of Democratic Leftism in Two Countries spans from World War II, in which Denitch fought in the Royal Yugoslav army, through the world of the '50s New York left, in which he rubbed shoulders with the likes of Max Schactman, Hal Draper and Michael Harrington, to the 1999 NATO bombing of Yugoslavia. 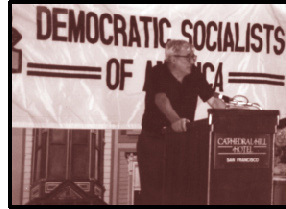 York, joined the editorial board of Dissent, co-founded the Democratic Socialists of America, and established himself as a leading scholar of Eastern European politics. The Hungarian-born sociologist Andrew Arato calls Denitch "simply the best American author writing about the states that used to constitute Yugoslavia." Two of his works form fascinating bookends to the Yugoslav wars of the first half of the '90s. Limits and Possibilities: The Crisis of Yugoslav Socialism and State Socialist Systems was published in 1990. Written before the breakup and published just as the bloodshed was beginning, it now reads as a prescient analysis of the forces which were about to tear the country apart. Ethnic Nationalism: The Tragic Death of Yugoslavia (1994, revised 1996) was his response to the cataclysm as it was taking place. In 1991, with a group of Yugoslav colleagues, he started an NGO called Transition to Democracy, with the purpose of fostering ethnic tolerance and social justice in a land becoming submerged in nationalist violence. It now operates offices in Croatia, Bosnia, Serbia and Kosovo. Denitch, now professor emeritus at CUNY, splits his time between his activist work and his writing, and between New York and Brac, the Dalmatian island in Croatia on the Adriatic Sea where he has had a home since the late '60s. You've argued that the breakup of Yugoslavia was not inevitable. How, precisely, do you think it could have been prevented? It could have been prevented had there not been a failure of the political class ruling in Yugoslavia, and of the American and Western European officials who were dealing with it--or, rather, who failed to deal with it. Had the United States come through with a $5 billion loan, Ante Markovic, the last reform president of Yugoslavia, might have been able to get the Yugoslav economy back on track. And Markovic needed it to have a carrot to give to local republic leaders as a stake for staying in the federation. Yugoslavia was so decentralized by this time that there were very few assets the federation had, leaving little by way of a compelling reason to stay in. And had the reform leaders of Vojvodina, Croatia, Slovenia and even part of the Bosnian and Serbian leadership ganged up against Milosevic when he began to show his cloven hoof, back in 1987-1988, Yugoslavia could have been saved. The federation had no business letting Kosovo be a Serbian problem. Kosovo was getting transfer funds from the more developed republics, but they had a political interest in it. The Kosovar leadership which Milosevic attacked in the mid-'80s was pro-Yugoslav. Once they got rid of them, all that remained was local nationalists and separatists. You're a Serb by origin, but Croatia is your homeland. How did this affect your life during the war between Serbia and Croatia? I was the target of many threats--phone calls from Croat nationalists saying they were going to cut my throat. The police in the early days of the war were not particularly protective of its citizens--on the contrary, many of them participated in the thuggery. And I was involved in polemics with the leading newspapers that were attacking me because of my criticisms of the Tudjman government's nationalism, its human rights abuses, its censorship of the press and its right-clericalist policies. I actually filed a slander suit against the leading paper in the country. I founded Transition to Democracy, which has chapters in Belgrade, Zagreb, Split and Sarajevo and a working group in Pristina. We started functioning right when the war broke out in 1991. We've held a meeting every year since then, bringing together human rights activists, trade unionists, opposition journalists from Croatia, Serbia, Bosnia, Kosovo, Slovenia, Montenegro, Macedonia and occasionally people from Bulgaria, Albania, Romania and Hungary. We're one of the few NGOs that makes a point of gathering people from all parts of the former Yugoslavia and beyond. These meetings, which we call the Summer School for Democracy and Social Justice, last one week each summer. We've been joined by solidarity activists from Germany, Sweden, Holland, France, the European Federation of Trade Unionists and other groups. What kinds of things has the organization accomplished? We have a multimedia project in Split, where we get young people together for alternative cultural events. We conduct a large monthly forum, attracting 300 to 600 people for debates, in Split, Novisad and Zagreb. We provide legal aid for refugees trying to return and to victims of human rights abuses. We're doing this in a way different than other NGOs who work on this: We sue cops and judges and local officials who obstruct the return of refugees or the return of minorities to jobs they've been thrown out of. We've got 53 cases going on at the moment in Croatia. We're going according to the Croatian government's claim that these expulsions were not a government policy--well, if they weren't government policy, then the people responsible must be held accountable and justice must be served. Remember that a quarter of a million Serbs were driven out of Croatia and another 100,000 or so left on their own. In 1992-1993, a lot of Serbs were thrown out of their apartments, completely illegally. Now we're getting some of these people to return, and to sue to get their apartments back. One of the more interesting ways we're going about this is we're suing for back rent: Someone's been living in my apartment for four or five years, I want that money! The reform government in Zagreb isn't bad on this; it's the local officials, left over from the Tudjman administration, who are the problem. Croatia's president, Stipe Mesic, is excellent--he's committed to human rights and to punishing Croatian war criminals. You've said that emotionally you're still a citizen of Yugoslavia--of what you call the "real" Yugoslavia. What do you mean by that? I mean a multi-ethnic state which makes a major effort to create equality for all of its national groups; one which is modernist and secular. Of all the one-party, state-socialist societies, Yugoslavia was by far the most liberal and open in Europe. It had political prisoners, but it also had a relatively free press. It certainly had a freer press than the post-Yugoslav states do. I think democratizing that Yugoslavia was a worthy and doable project, a far better one than building these micro-states, all of which are going to be less independent than Yugoslavia was. The estimate in Croatia is that it will take roughly 20 years to reach the relative living standards that it had in 1989. Was it worth it? I don't think so. A fight to get rid of Milosevic inside Yugoslavia would have taken far less effort--and could have prevented the wars and the disintegration of the country. Let's talk about your position on the Kosovo intervention. It was a very hard position for me to adopt. It horrified my relatives, longtime associates, close friends and comrades in Belgrade. But my position was that there had to be an intervention. I reject the claim that it was the intervention that caused the mass exodus of the Albanians. Massive killings and expulsions were taking place before the NATO intervention, and there was a record of more than 10 years of Serbian repression against the Albanians in Kosovo. Virtually every male Albanian had been in the hands of the Serbian police at one point or another, and those were not tender hands. But the way it was carried out was another matter. Announcing the bombing plans three months in advance was sheer idiocy on Clinton's part. And the U.S. doctrine that you can't risk the lives of your soldiers is scandalous. What it says is that no matter how many civilian lives might be at risk as a consequence of that policy, you're going to bomb, from up in the air where accuracy is impossible. So I was against an air campaign if ground troops weren't also involved. My view was that the intervention should have been done on land, and quickly, without letting the Serbs build up, and they should have occupied Kosovo. An earlier and quicker land intervention would have been more successful and done less damage. Had it been done this way, among other consequences, it would have been a lot less possible for the Albanians to take revenge on the Serbs who remained. What are your thoughts on the arrest of Milosevic? The Serbian establishment was split on exactly how to do it. I hope it's a step on the road to The Hague. It's essential he be tried in Belgrade for his crimes in Serbia and in The Hague for his war crimes. But I don't think he can be given a fair trial in Serbia. Either the judges will be too hostile toward him or his appointees will be too protective of him. I think the government made a mistake in not delivering him to The Hague. By keeping it in Belgrade they lose either way: If the sentence is too light, it will be illegitimate in the court of world opinion; and if the sentence isn't properly documented legally and so on, again it will be considered a joke. It's a crisis of legitimacy. I think they had to bite the bullet and argue (which some of my friends in Belgrade do) that to send him to The Hague is not to send him abroad, so they don't need to change the constitution to send him there, because The Hague is a U.N. institution and therefore not in a foreign country. What about the argument, made not just by Serbian nationalists but by many Western leftists, that The Hague is largely a tool of the United States and NATO? I think that's crap. The United States is the sole remaining superpower--of course it's going to have a major influence on international institutions. The question is: What is that influence? Is it good or bad in this case? In my view the United States has been too soft on the war crimes issue. They haven't pushed for the punishment of enough people. What kind of future do you see emerging today in the former Yugoslavia? I'm afraid I see a very rough future, given the situation in the world economy and in Europe. The safety valve of Europe, for unemployed people to go find work, is gone, and that's going to hurt. Brain drain is also hurting Croatia and Serbia very badly. The economy in Serbia is really very far gone. I think they have to steer an extremely cautious course to avoid taking the IMF/World Bank formula whole; they have to steer between the possible and the desirable. I think the Macedonians are going to find themselves paying a very heavy price for their adventure in Taiwan; their recognition of Taiwan and establishing official relations with the island means that China is going to veto aid to Macedonia. The central problem in all areas of the former Yugoslavia--except for Slovenia--is the stupendous level of corruption and the difficulty in re-establishing a legitimate civil society with legitimate institutions. Danny Postel is the editor of the forthcoming Debating Kosovo, a book about the split in left opinion over the Kosovo intervention. Transition to Democracy can be contacted at ttd@igc.org.